I've just climbed into the passenger seat of a car driven entirely by a smartphone, using nothing more than a high-speed camera mounted to the roof to see where it's going. My fate is literally in the hands of this phone. "Lots of people have been questioning us on [our smartphone] AI," Huawei's Senior Product Marketing Manager, Peter Gauden told us at MWC 2018. "So we've developed a showcase to give people a visual representation of what we can do." Now, before I go further, a caveat about this driverless car experience. 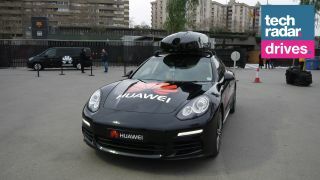 The driverless technology here is nowhere near as advanced as that being developed by automotive manufacturers, but that's not what Huawei is trying to achieve. Rather, it wants to show the power of the AI (artificial intelligence) inside its flagship Huawei Mate 10 Pro phone in a visual way, because it's finding it difficult to explain to consumers. There's no radar or lidar (which uses pulses of laser light where radar uses radio waves) system, which are what the more advanced systems from car companies use, here; instead the Mate 10 Pro is plugged directly (via a HDMI cable) to a roof-mounted high-speed camera. This camera relays a live feed of what's ahead of the car to the phone, and it's up to the Mate 10 Pro to process what it's seeing and then make decisions on its actions. The phone then communicates actions to the robotic drive system, telling the car to keep going, swerve left, swerve right or stop. All the computational processing, machine learning and artificial intelligence is done on the handset itself, with no external system providing additional support. So, does it work? I grabbed a change of pants and found out for you. As I've mentioned, this isn't an autonomous, driverless car – this is a demonstration of what Huawei's smartphone AI can do – and that means before we go on our 'full-speed' run we have to teach the AI what to look out for. This involves a training run along the short course at 5mph, with the Mate 10 Pro scanning for objects. For our run there was a cyclist, a football and a dog – well, pictures of them anyway (you know, just in case). I selected the training option on the purpose-built app on the phone, and then hit 'Go' to set the wheels in motion. We cruised along the course, and the Mate 10 Pro was able to pick up the pictures of the obstacles and correctly identify each one before they were swiftly dragged out of our path. Training run completed, our instructor hopped into the car and reserved it back to the start (remember, this isn't a driverless car, this is a smartphone AI demo). Now for the 'full run', during which the Porsche would speed at up to 30mph (unfortunately the top speed allowed by the health and safety fun police) towards an object of my choosing – I went for the bike – and hopefully not smash it to pieces. I selected 'full run' from the app on the phone, and selected the cyclist as my obstacle. I was then given three options for what the car could do if it detected this particular obstacle: swerve right, swerve left or stop. I chose 'swerve right'. Then I hit 'Go', and the Mate 10 Pro floored it. As we picked up speed, the phone was able to correctly identify the cyclist (which it had learned from the training run) and swerve to the right of the obstacle at a safe speed and distance, before gently applying the brakes and coming to a stop. I quickly count my limbs. All present and correct. Success. As I said at the start, Huawei isn't in the driverless car business, which means the specific AI feature that avoided the cyclist won't be baked into its handsets. Rather, the intelligence will be tailored to take some of the stresses out of your daily life. "[AI] takes the small, fiddly things off your daily workload. [Your] phone will automatically set alarms, remind you of events, change settings, enable power saving and more, and it gets better while you're using it," Gauden explained. "The phone will be truly yours, customized to exactly what you want."